Before we had children, my husband and I loved to travel. We loved eating out, exploring new cities, visiting attractions, seeing sights and discovering new places. 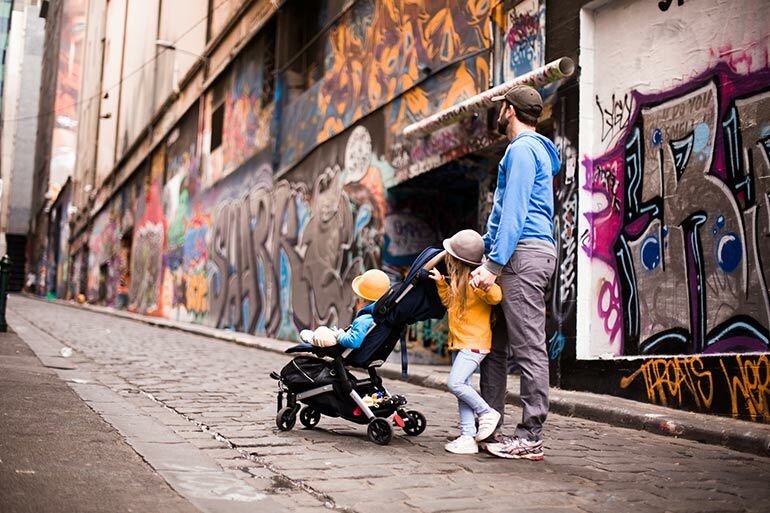 That’s been trickier as parents, but we recently took our five-year-old and two-year-old on holiday to Melbourne and were lucky enough to have a new Redsbaby SKIP stroller along for the trip. Did we like it? Keep on reading to find out. 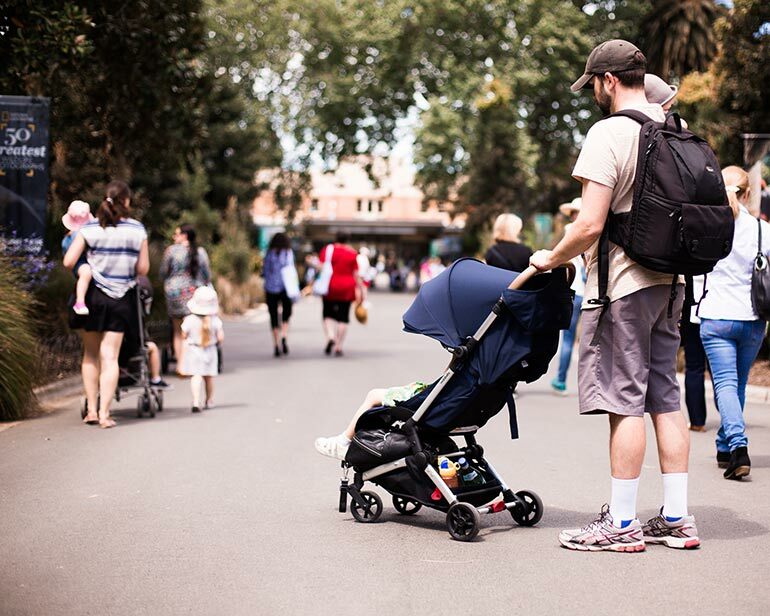 It’s hard to overstate how much easier this travel stroller made our holiday. It meant we could keep our little runner safe when we were in the busy city streets and moving around airports (no Home Alone moments for us!). We enjoyed the freedom we had knowing he was safe and secure while we explored, took photos, saw sights and enjoyed our holiday. The SKIP was great for everything from just ducking out to a cafe to taking for a whole day adventuring. The SKIP is also a super compact pram so fit easily into our car with all our luggage for nearly a week away. 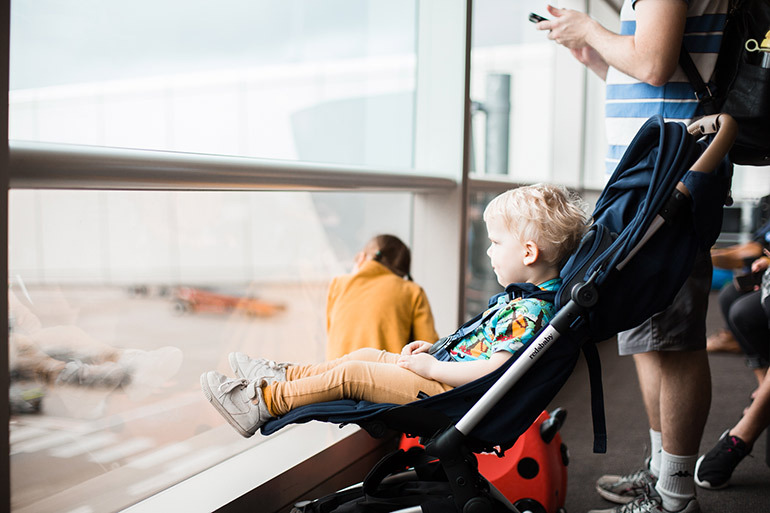 There’s a really handy carry strap too, so we could sling it over a shoulder while boarding the plane, getting onto a bus or climbing stairs and still have our hands free for the kids. And the accessories, oh the accessories! 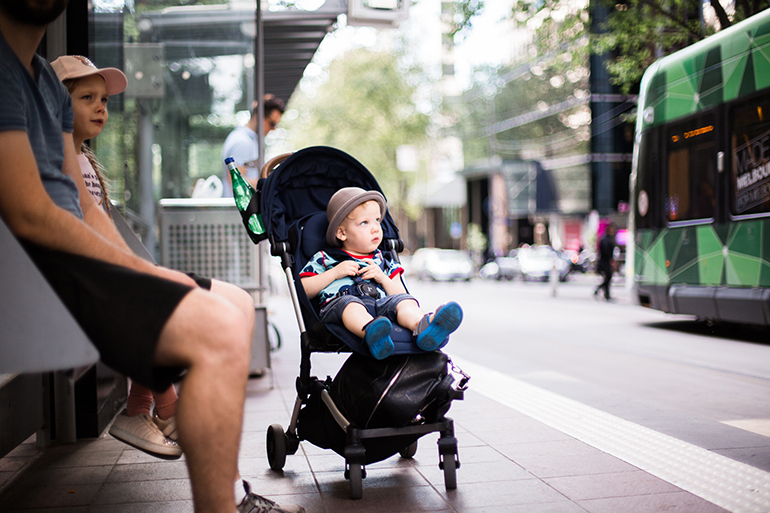 There’s a whole swag of them and all just as well-designed as the stroller. The SKIP organiser attaches easily to the handle and was the perfect place to store my phone, the map when we were at the zoo, public transport cards for touching on and off – it was super handy and I found myself using this pocket all the time. The head pillow and seat liner easily attached to the pram and added to the comfort, especially for extended trips. It would also be easier to clean the liner than the pram itself, and I loved how it fit perfectly and matched the SKIP. While we mostly had good fortune with the Melbourne weather, we were grateful for the rain cover when caught by sudden showers. It was easy to use and provided excellent coverage, keeping our little one snug and dry. We also tried out the sun and sleep shade – it’s very easy to attach to the pram hood and provides cover to the entire pram. The cup holder was another favourite accessory – it easily slides on to the side of the handle and it can go on either side (which I was particularly impressed with as a leftie). It was great having a drink bottle conveniently located right by my hands. 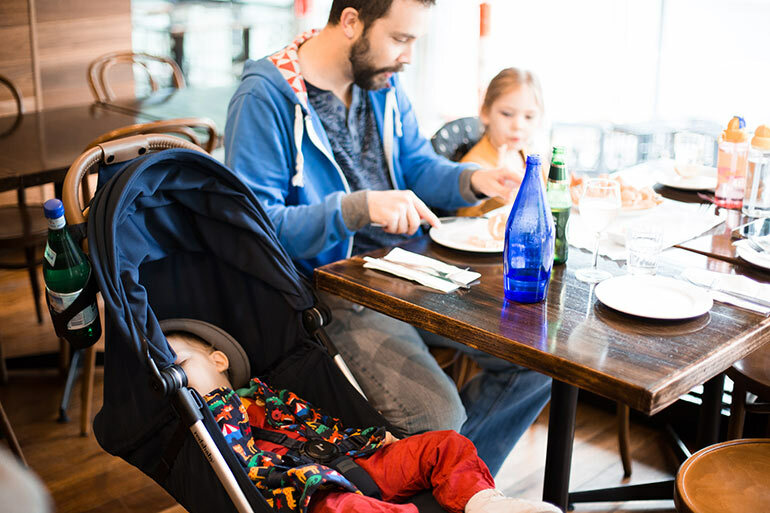 This super handy travel pram retails for $399. Want to see more? Take a look at this video that shows the brilliant Redsbaby SKIP travel pram in action. It folds up small enough to fit in the overhead luggage compartment! This means you can roll right up to the gate of the plane – our excited two-year-old was safely buckled in right up until he had to be safely buckled in! It also meant we had the SKIP right with us as we claimed the rest of our luggage and made our way through the busy and crowded airport. While my son rarely naps at home these days, huge outings and late nights on holidays meant he was nodding off in the Redsbaby SKIP. This was perfect as we could just lay him back and the three of us could keep exploring (and even enjoy a sneaky ice-cream while he napped). The shade provided by the sun cover was wonderful for Australian adventures! 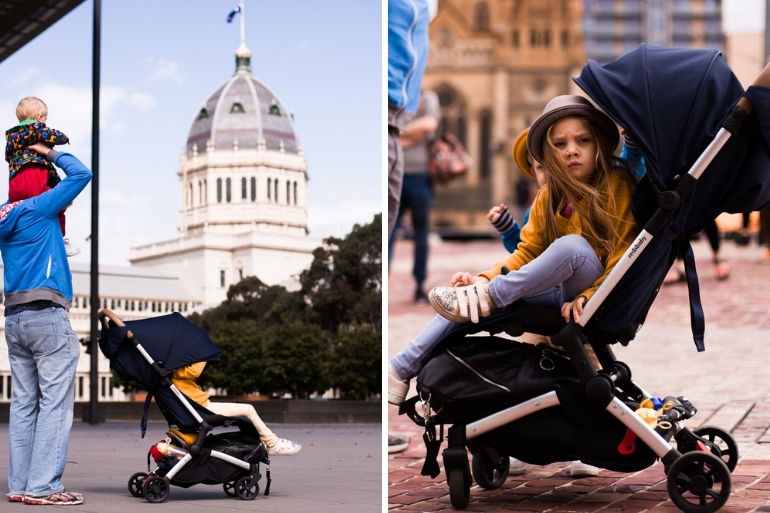 We had great luck with the Melbourne weather with warm days and sunshine for most of our trip, so the generous hood on this travel pram came in very handy. 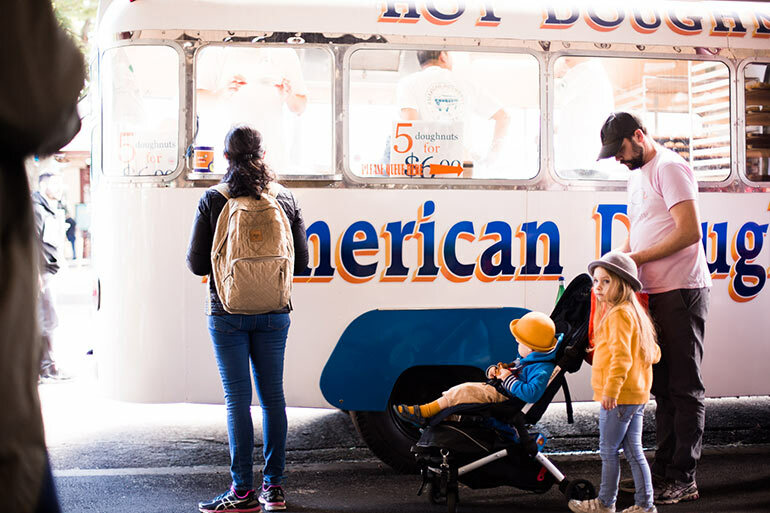 This also makes the Redsbaby SKIP easy to manoeuvre to get through tight spaces like markets and shops, getting on and off public transport, and into restaurants and other places you might find and want to explore. It also handled just fine over bumpy surfaces like uneven paths and cross country through parks and grassy areas. And when we had to carry it, the light 6.5 kilo weight meant no sore shoulders or awkward lifting. This meant the SKIP could also hold my five-year-old safely so when her legs were tired after a big day exploring, she could take a turn in the pram and our little one could run (or sit on someone’s shoulders). I highly recommend the Redsbaby SKIP to anyone looking for a quality travel pram, or even a compact and lightweight pram for everyday use and running around. It’s a great option and it really made our holiday. This would be the perfect stroller for holidays, trying to juggle two small ones up to the boarding gate can be a struggle, but this would be amazing. Whether it be rain hail or shine the ease and comfort will mean any outing is a hit! We have our first family OS trip booked for next year as a family of 7. 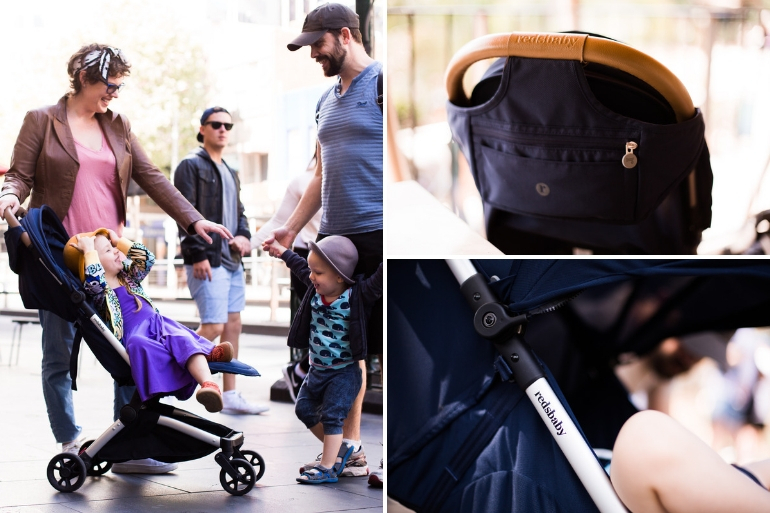 Knowing our bubbas transportation is sturdy, lightweight, compact and super stylish would make our site seeing so much more enjoyable. How good would this be! I love that you can fold it up and carry it! The compact fold is amazing on this! Imagine being able to fit things in the car alongside the stroller instead of playing tetris everytime you wanted to buy something. This looks incredible! 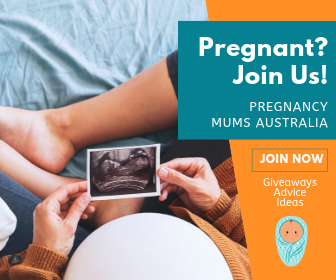 I’m currently pregnant and we have our first trip (Uluru) coming up when baby is 6 months old. This would be just perfect for travel. I also love how light it is as we don’t have a car. 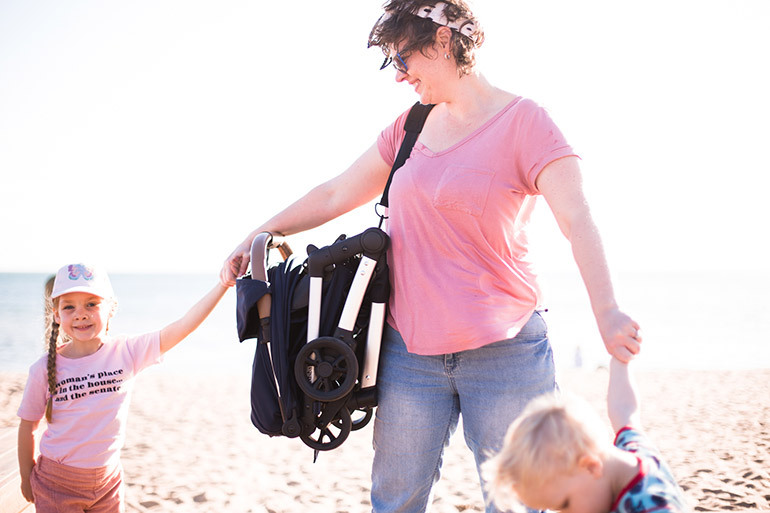 This pram is perfect – folding up and able to carry it! We love our skip we recently purchased for a trip. The grandparents would love one for when they have the grandkids! Perfect for going Down to Melbourne to visit family, we have an old pram that is on it’s last legs. I’ve searched online for hours for the perfect compact travel pram for my 4-month-old (meaning deep recline necessary) that can also hold my incredibly tall 3-year-old when she needs a rest. This is by far the most promising as none of the others seem to meet that need! We are going to visit my family and friends on a multi-stop USA vacation in 3 weeks and I would be over the moon to have this pram for the trip. 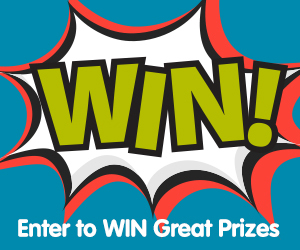 Have the winners for this been announced? ?